What would it be like to approach the city from the perspective of an animal pushed out of its home by development, water falling during rain, or a windblown seed wanting to take root? What structures and spaces could be created or adjusted to make the city a more welcoming place for nature and wildlife? How could nature improve the urban environment if things were designed to welcome the natural world instead of seeing wildlife as unwelcomed invaders? 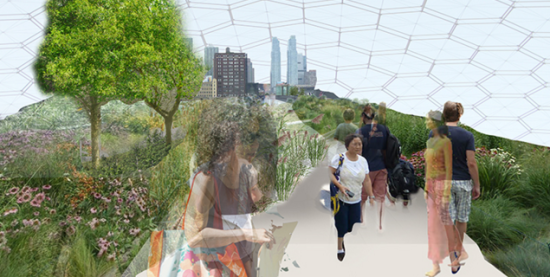 This special event will start with a short tour around NatureStructure by exhibition curator Scott Burnham, followed by a session in which participants will brainstorm ideas for a more nature-centric city and draw on the windows of BSA Space gallery, sketching their ideas for a more harmonious relationship between nature and the city. All skill levels are welcome. You do not need to be a master sketcher to participate. Snacks, beer, and wine will be provided. Places are limited so reserve your spot today! 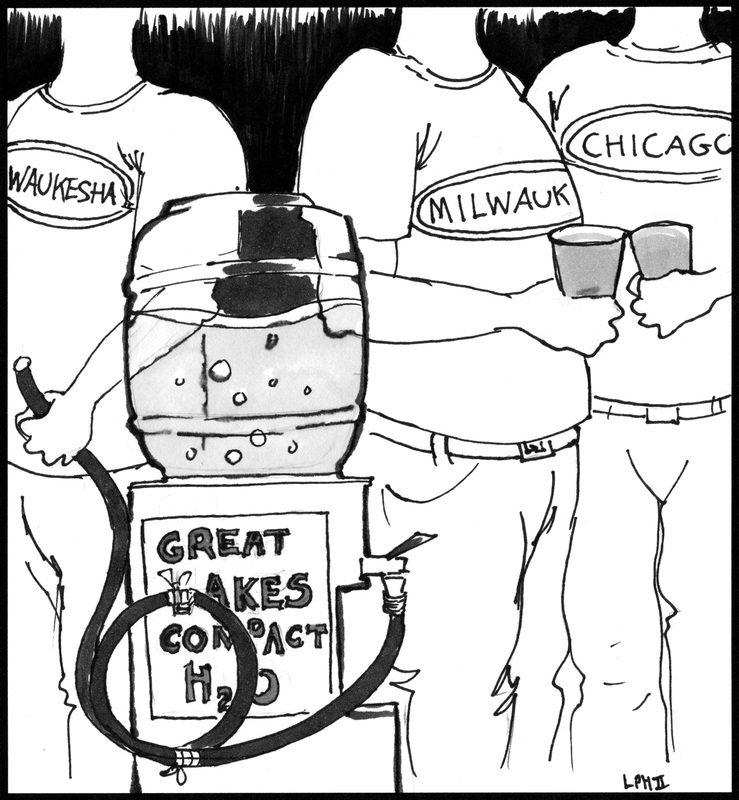 Milwaukee has a complex relationship with water. Along with its location on the shore of Lake Michigan, three major rivers flow through the city. Historically, the city has relied upon these water sources to drive industry, including leather tanning, food processing, and, of course, beer brewing. Since the decline of its heavy industry starting in the mid-20th century, the city has grappled with how to remediate its water system. Now a group of artists have a proposal to help bring the public into the conversation about the city’s water use. Currently all rain water and sewage in the city is filtered through the Jones Island water treatment facility on the lakefront before being returned to the lake. 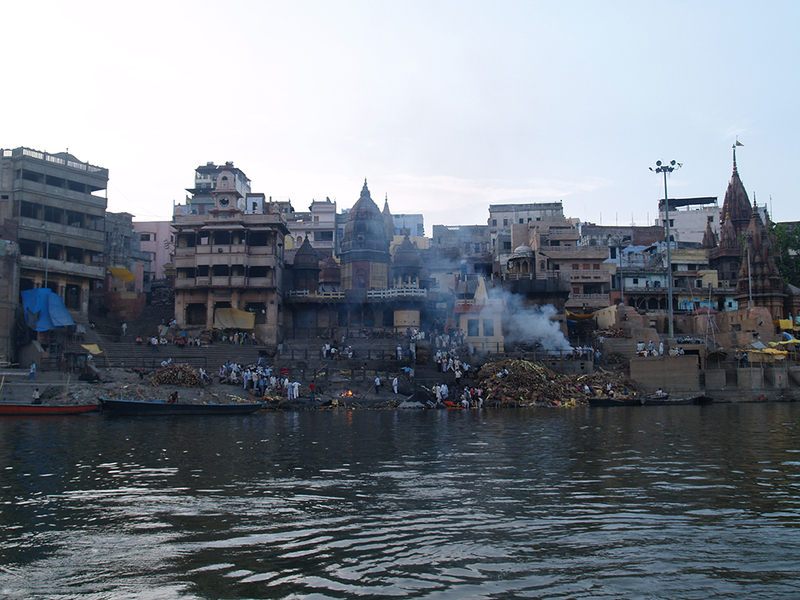 During typical rain events, this system works to keep polluted water out of the lake, but when extreme rainfall hits the city, the system can quickly become overwhelmed, resulting in sewage being discharged directly into the lake, which is also where all of the city’s drinking water is drawn from. WaterMarks is an initiative to help educate and engage with the public surrounding water issues. Launched by City as Living Laboratory: Sustainability Made Tangible through the Arts (CALL), the program hopes to install physical markers throughout the city to inform the public about major water events and educate them on the water systems that are often right under their feet. WaterMarks intends to “create a city scaled 3-D diagram of the multi-faceted manifestations of water” in the form of large-scale lettered markers, like dropped map pins throughout the city. Each marker would correspond with a different water system. Residents will also be able to access a WaterMarks app, which will supplement the markers and give information about additional public programming associated with the project. 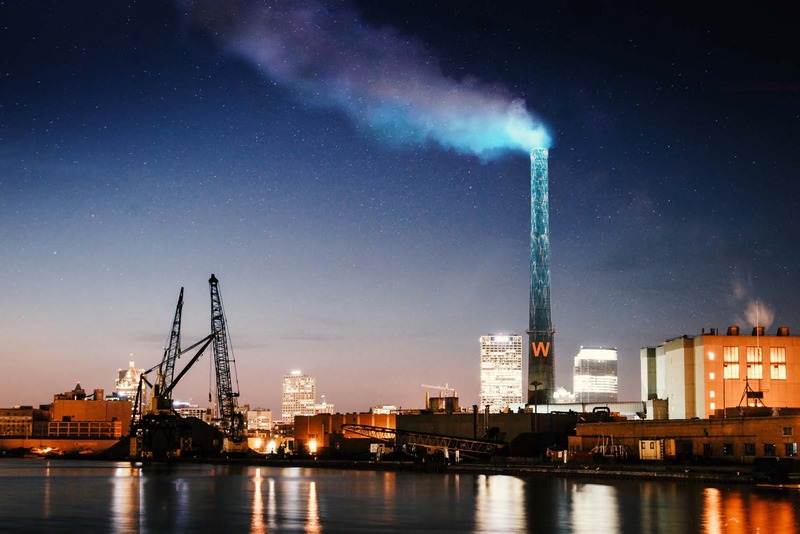 The first phase of the project proposes to engage with the Jones Island smoke stack, which sits in a highly visible space in Milwaukee’s Inner Harbor. 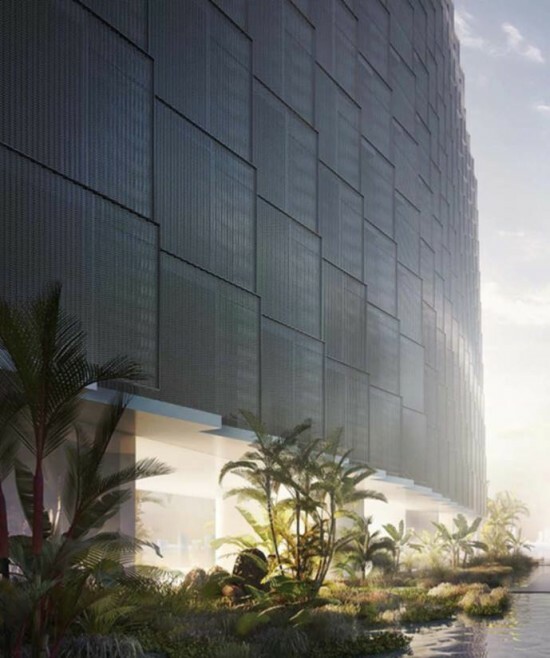 WaterMarks’ plan is to illuminate the stack in order to signify the state of the water system. Blue will indicate the system is functioning at normal levels, while red will be shown ahead of impending heavy rains to encourage residents to think about their water usage and prepare. WaterMarks has been developed over the last three years with the support of Marquette University and a recent grant from Institute of Museum and Library Services. That grant will go towards initial prototyping and developing programming for the project with the help of Haggerty Museum at Marquette. The projected budget of $3.6 million was arrived at through conversations with the public as well as the Development Department, Department of Public Works and the Metropolitan Milwaukee Sewer Department, who helped identify the city’s needs. WaterMarks: An Atlas of Water for the City of Milwaukee from City as Living Laboratory on Vimeo. Canal lovers near and far, gird your loins. 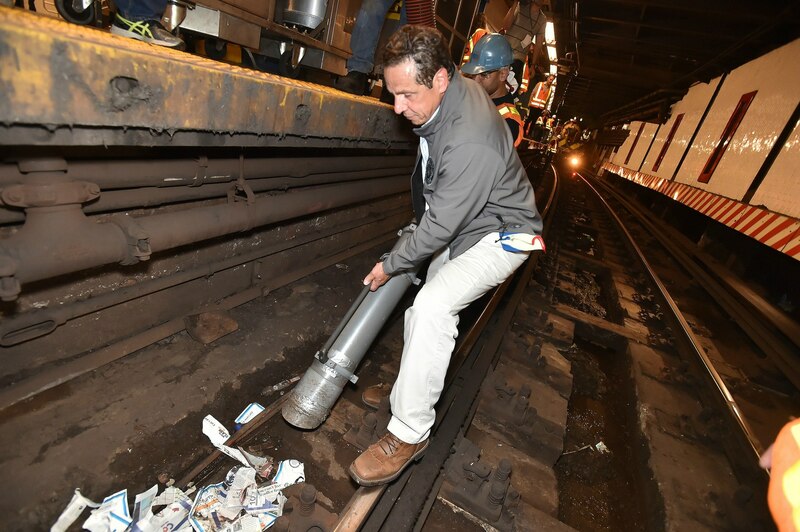 In his latest infrastructural move, Governor Cuomo announced a global competition to re-imagine the New York State Canal System as a tourist destination and an economic driver for upstate communities. Up to $2.5 million will be awarded to the finalists and winners to implement their designs. Many may not realize that it is possible to get from Whitehall, New York all the way to Buffalo entirely by canal (there should be a Paddle to the Sea for this), but with this announcement Governor Cuomo is looking to draw the public eye back to one of the state's greatest historic, economic, ecological, and recreational resources – and to the urban spaces dotting the blueway end to end. 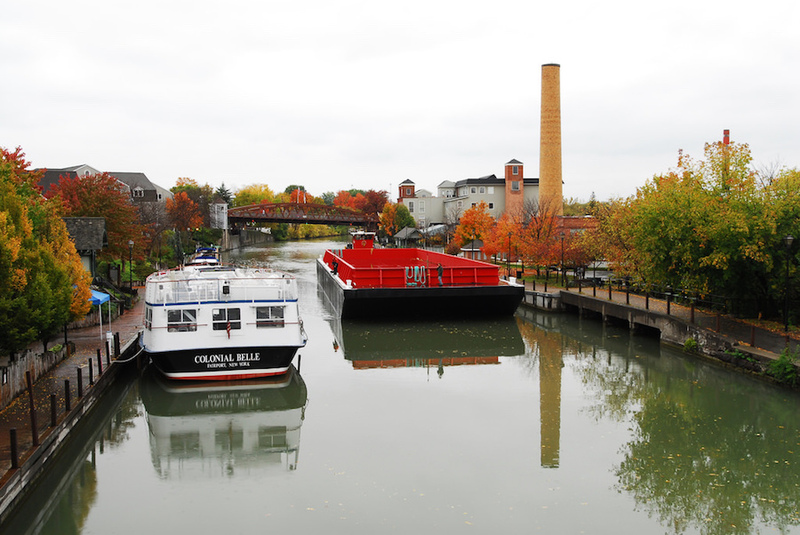 The competition was timed to coincide with the bicentennial celebration of the Erie Canal that begins this year and will continue until 2025, which commemorates its construction from 1817 to 1825. Additionally, next year will mark the centennial of the New York State Canal System, 524 miles in total, which was designated a National Historic Landmark in 2016. The competition's goals are admittedly somewhat vague and broad at this stage, with a charge to promote the canal system as a "recreational asset," encourage "sustainable economic development" along its route, celebrate its heritage, and so on. However, the challenge is clearly divided into two tracks: one focused on the infrastructure itself, another focused on the development of recreation and tourism opportunities. Submissions for the first round of entries are due at the beginning of December 2017. The finalists will receive $50,000 to implement their proposal in partnership with a municipality adjacent to a canal or a non-profit whose work relates to the canal system. The final winner or winners will receive anywhere from $250,00 to $1.5 million – a fairly large range, by our estimation – to plan and build their projects. With the Regional Plan Association's recent announcement of a plan to connect and expand New York's trail systems up into the mid-Hudson valley, Cuomo's canal competition has AN wondering: if both plans are implemented, will it be possible to depart from our Tribeca office, hike to Albany on public lands, and set off for the Great Lakes via canoe through the newly revamped canal system? Only time will tell. In and around Waco, Texas, public officials are working to create a county-wide “water grid” that would enable various water suppliers to work together to conserve and share water during droughts. According to the Waco Tribune-Herald, McLennan County, Texas, has launched a study to determine the best way to make sure water is available to the residents of Waco and the surrounding region by pooling the resources of various suppliers. County judge Scott Felton, an advocate for sustainable water planning and conservation, is leading the effort. Last year, Felton brought together the McLennan County Water Resources Group to help communities plan for shortages of clean water and the advent of contaminated water. The group secured a $75,000 grant from the U.S. Bureau of Reclamation to help fund the study. Others working with McLennan County on the study include cities in the region, water supply corporations, the Brazos River Authority, a groundwater conservation district, and local residents and businesses. Felton told the Waco Tribune-Herald that good planning is necessary to make sure water is available when it’s needed. Even though the Greater Waco region’s water supply is more plentiful than some areas in Texas, Felton warns that communities need to become less dependent on groundwater from the shrinking Trinity Aquifer, which extends across central and northeastern Texas. “What’s constant in this county is that our groundwater is going down, whether it’s raining or dry,” he said. Tom Ray, water resources coordinator with Lockwood, Andrews & Newnam in Waco, the lead consultant on the study, told the Waco Tribune-Herald that the Trinity Aquifer is expected to drop between 250 and 450 feet by 2040. That’s as much as 19 feet a year in the Hewitt and Bellmead areas, which are expected to see the biggest drops. County and city leaders say they envision a network of pipelines that could connect water users around the county and allow them to share water as needed. The final cost of that pipeline network is still under study. The completed plan will establish a process for monitoring short-and long-term water availability, predict the probability for future droughts, evaluate the risks and impacts of drought, and prioritize mitigation actions. 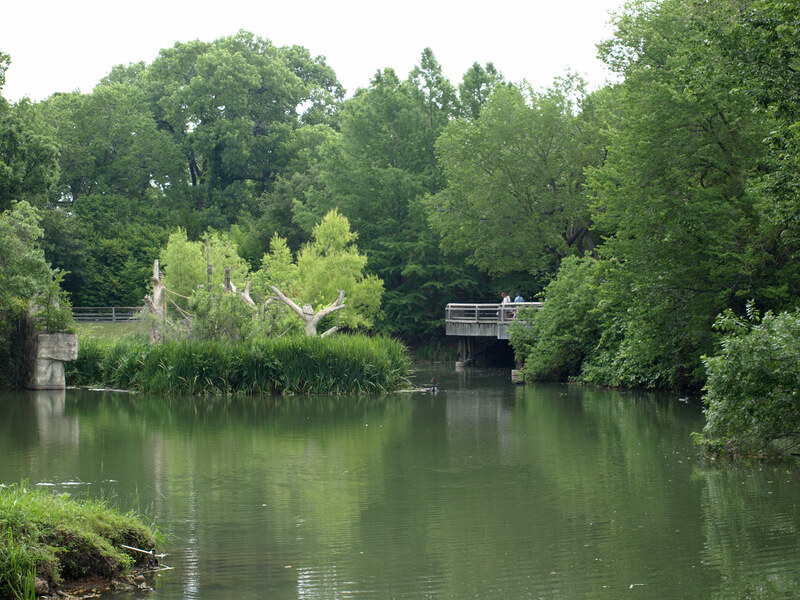 Other ideas under study, according to the planners, include reclaiming more treated water from a regional sewer plant, making use of extensive water rights that the city has held in the Brazos River since 1914 (but does not use), and making more use of the Bluebonnet Water System, which draws water from Lake Belton. Art has washed up on the banks of southern Indiana's White River. Converging south of Indianapolis near Columbus, Indiana, the river's two forks draw from a series of small tributaries, which an artist working with grant money from the National Science Foundation has chosen as the setting for an interactive public art series meant to provoke discussions on water, environment, and climate. 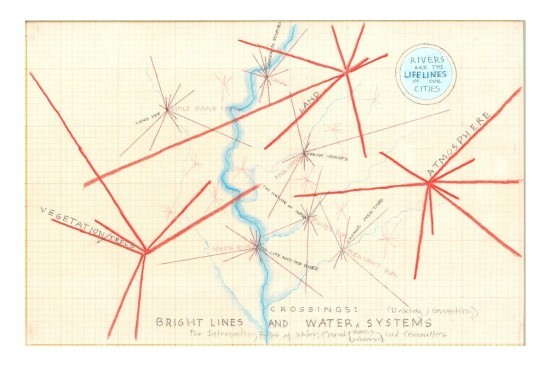 New York–based Mary Miss and City as Living Laboratory kick off Streamlines on Thursday, ushering in “a multi-faceted project to foster science learning through the arts in the public realm” in five communities along tributaries to Indiana's White River. 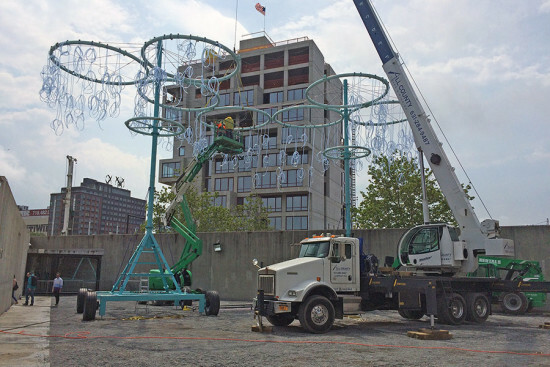 Miss’ StreamLine installations include sculpture, music, dance, and poetry, and will take place over two years. The work is supported by a grant from the National Science Foundation to Butler University Center for Urban Ecology. What appears to be an explosive invasion of tiny black orbs is actually one small part of the solution to Los Angeles' four-year drought. 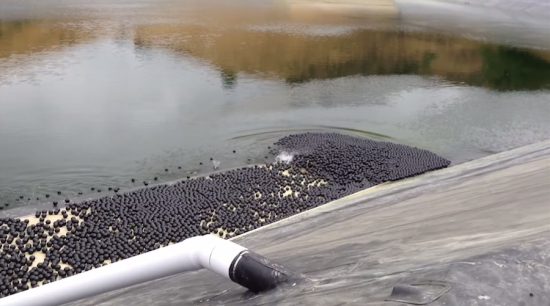 Colloquially called "shade balls," these 36 cent buoyant spheres are a part of a $34.5 million water quality protection project by the Los Angeles Department of Water and Power (LADWP). The department deployed the last 20,000 of the approximately 96 million shade balls this past week. The simple technology helps prevent water contamination and evaporation. According to NPR, LADWP General Manager Marcie Edwards applauded the innovative alternative to a dam and tarp solution, which would have cost a whopping $300 million. "This is a blend of how engineering really meets common sense," Edwards told NPR. "We saved a lot of money; we did all the right things." The 4-inch-diameter polyethylene balls, produced by California startup XavierC, help slow evaporation and are chemically coated to block ultraviolet rays that can potentially cause a chemical reaction that could produce the cancer-causing chemical bromate. The hollow, water filled plastic spheres are expected to save 300 million gallons of water annually, enough to quench the thirst of 8,100 individuals a year.